Today kicks off the first of some wonderful guest posts while Jenna is out on maternity leave. 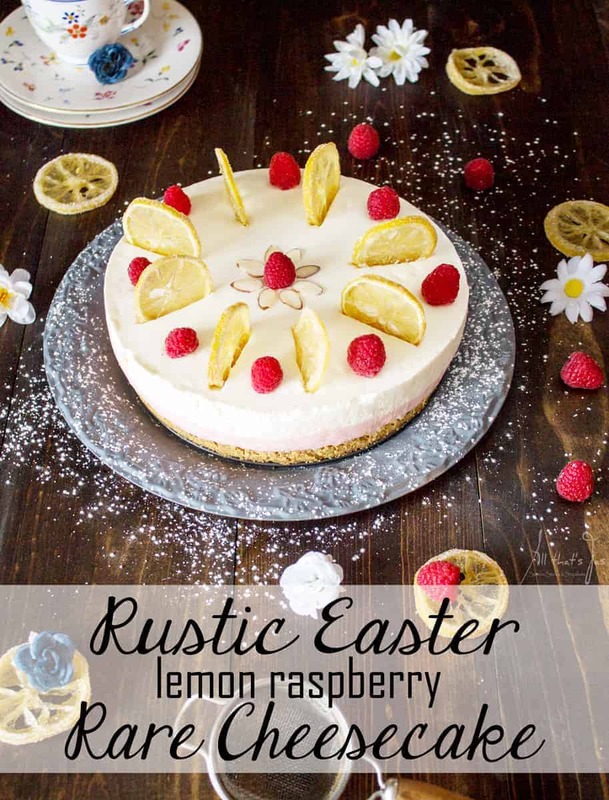 Hi, it’s Jas from All that’s Jas and today I am sharing with you my recipe for a rustic Easter lemon raspberry rare cheesecake. You know when you try a new recipe and you like it so much you have to make it again asap? That happened to me when I made my first rare cheesecake. What’s the big deal, you might ask. None, except when you eat two cheesecakes in one week your clothes don’t quite fit the same anymore. Being a cheesecake addict, and I have cholesterol levels to prove it, I shouldn’t be allowed near one, much less two. It was worth it. 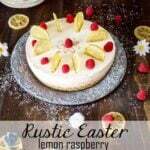 The silky texture is unforgettable and the pairing of lemon and raspberry is one of my favorite fruit flavor combinations. Not to mention the two layers, my all-time must have in cheesecakes. The most popular by far is my tiramisu cheesecake, but layered maple cheesecake and baklava cheesecake are the second best. The other ones I made aren’t so bad either, if I may say so myself. So, why is this cheesecake called rare? Japanese call no-bake cheesecake a rare cheesecake (if you’ve ever ordered your steak rare, it’ll make sense to you). Now, I could’ve named my cake no-bake cheesecake, but I have to keep up with the trend, and rare is in right now. 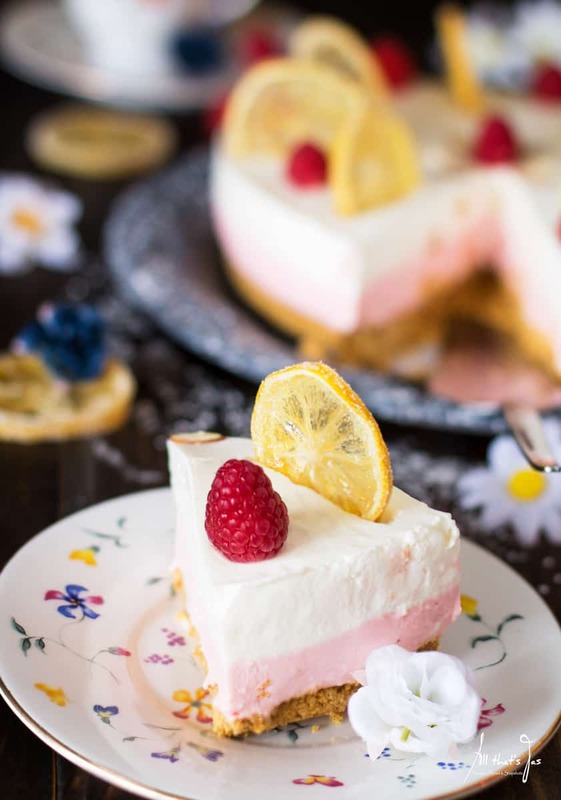 Besides, Japanese use gelatin to harden the filling and they also use yogurt* instead of the heavy cream (I mixed yogurt and heavy cream because I’m using lemon and didn’t want the cake to be too tart. Also, this cake is not overly sweet as traditional cheesecakes are). I followed their basic rare cheesecake recipe, so there you have it. 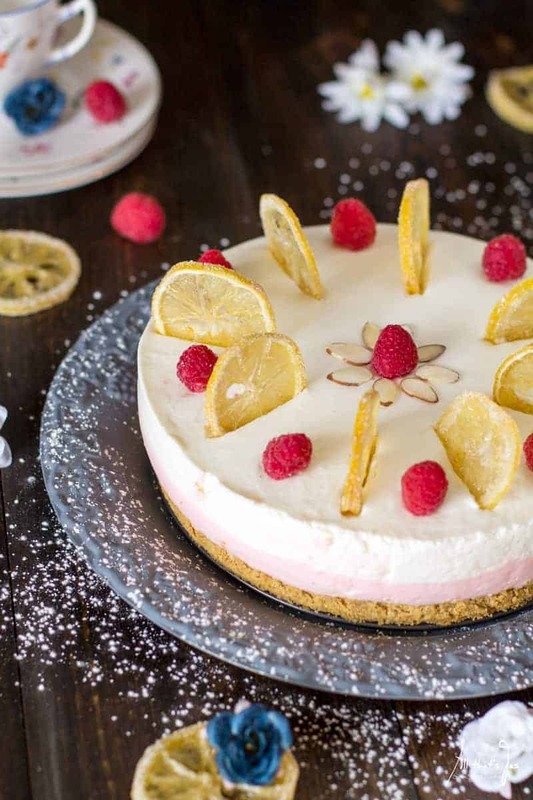 The cheesecake is simply decorated but looks gorgeous! Candied lemon slices recipe below - make ahead! Combine crushed cookies with melted butter. You can crush them using a food processor or put them in a Ziploc bag and roll over with a rolling pin until finely crushed. Line an 8-inch springform with wax or parchment paper. Press cookie crumb mixture on the bottom of the pan. Refrigerate. In the meantime, beat the cream cheese with an electric mixer until smooth. Add sugar, heavy cream, yogurt, vanilla, lemon zest, and lemon juice. Mix well. In a small bowl, pour boiling water over gelatin. Stir until gelatin is completely dissolved. Let cool slightly. If it cools too much and it hardens, microwave for 15-20 seconds. Do not boil. 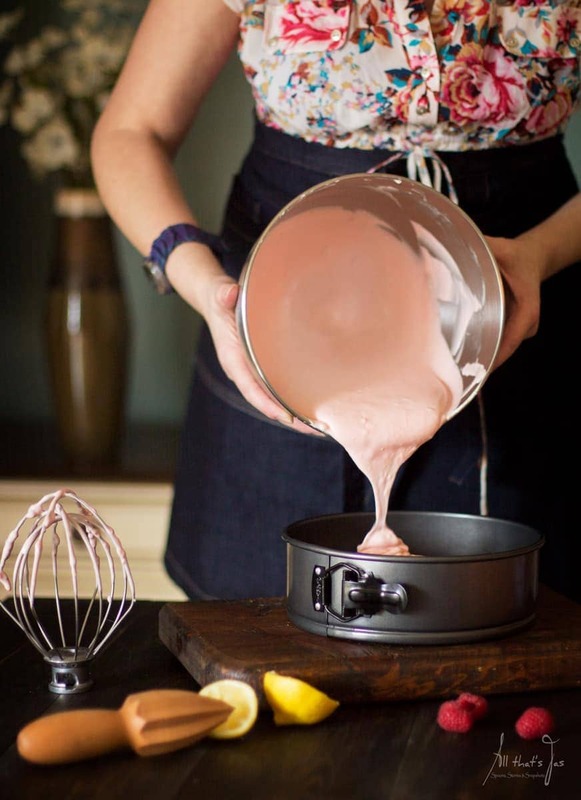 Gradually beat in gelatin mixture into the cream cheese mixture. Pour half of the filling over the crust and freeze it until just set, about 15-20 minutes. Meanwhile, mix remaining filling with raspberry jam. Pour gently over the first filling layer. Refrigerate until completely set, about four hours. Gently remove the rim of the springform. Run a knife alongside the rim first, then using a kitchen torch or a hot towel warm up the sides a bit and release it. Decorate the cake as desired. Keep refrigerated. 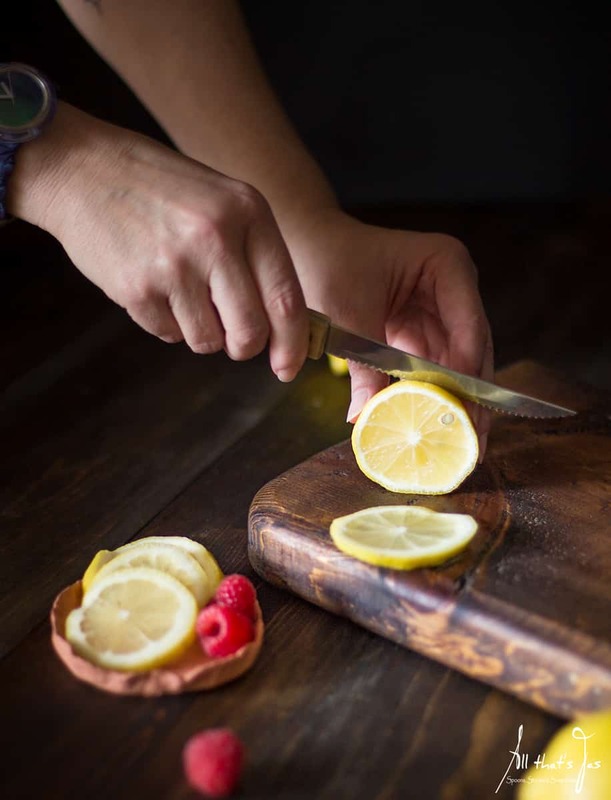 Cut large lemon into thin slices. In a saucepan, mix 2 cups granulated sugar with 1 cup water until sugar is dissolved. Bring to a simmer. Add the lemon slices and simmer for 30 minutes. Drain and let the lemon slices air dry for a day. 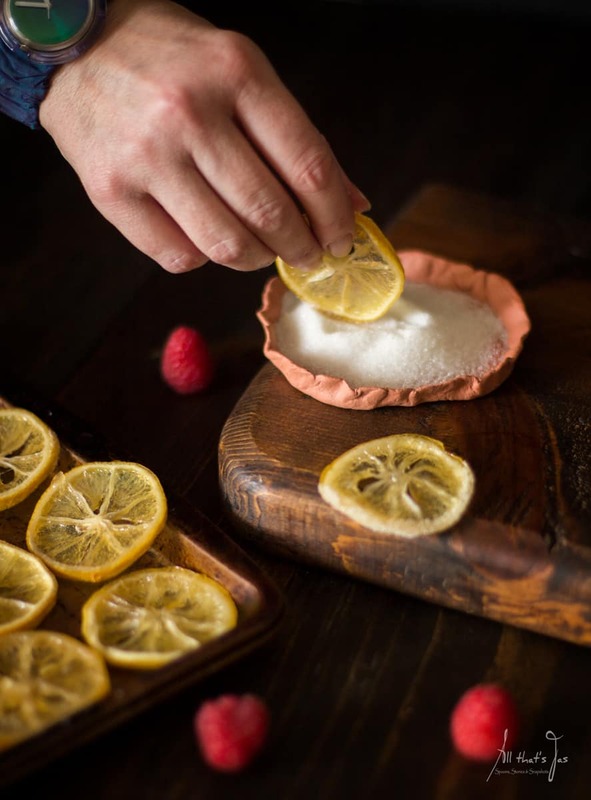 Dip the lemon rim in sugar if you wish before decorating the cake. 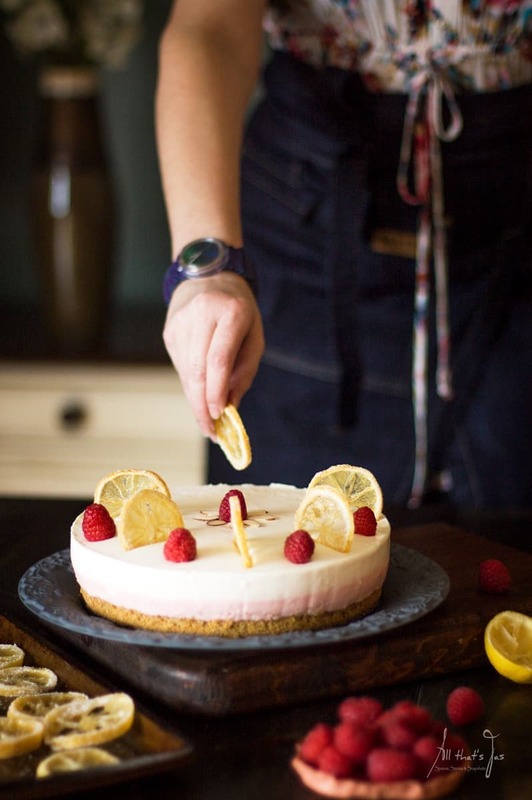 If you liked this rare cake, I’m sure you will like my Valentine’s Day Rare Cheesecake too.